Once the casino opens, guests can walk up to their favorite table and hand their $500 to the dealer, who will in turn exchange this money for casino chips. 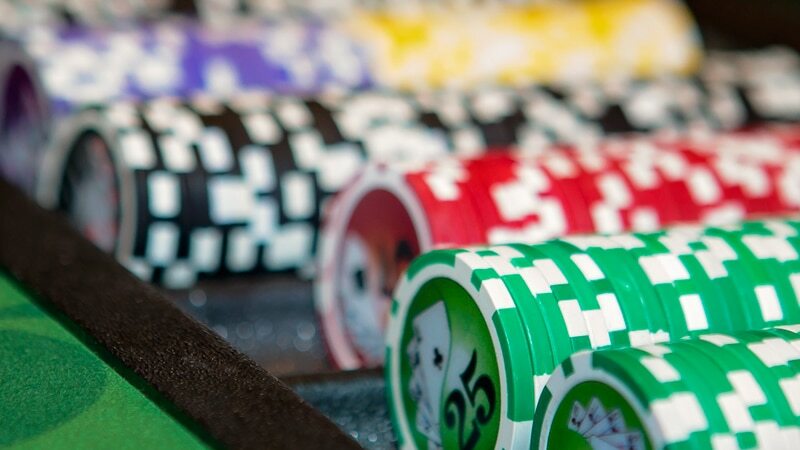 Our casino chips are clearly marked with denominations that range from $5 to $1,000, and each denomination has a different color so guests can easily tell each one apart. Typically, once they hand in their casino money to the dealer, guests receive a combination of $5, $25 chips and $100 chips to start. Because our smallest chips are $5 denominations, $5 usually serves as the minimum bet at most tables. Once guests start getting involved in the action, their stack of $5, $25 and $100 chips might start getting larger and larger, at which point the dealer at their table might “color them up” and exchange their smaller denomination chips for larger‐valued chips. In this way, as guests go from table to table, they’re not necessarily carrying an unwieldy amount of chips. »What if someone runs out of chips?